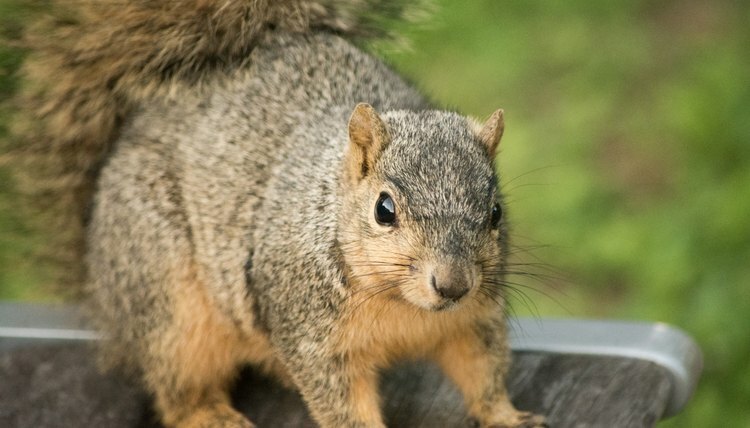 Remember, squirrels are still wild animals that can bite and scratch you. If you find a baby squirrel, make sure to educate yourself to the proper care and dietary needs. The more regular you feed the squirrels, the more regular their appearance will be. Patience is the key when it comes to trying to tame a wild squirrel. Just like some people are friendlier than others, so are squirrels. They are smarter than most people think and are hard wired to not completely trust humans. Each one probably has a family member that ended up on someone's dinner plate, so you can't blame them. The easiest squirrel to tame is a baby, but not everyone is fortunate enough to find one small enough to tame from the beginning. Still, with a little patience and perseverance, you should be able to get one or two to warm up to you. Create an area where you can leave food for them. A yard filled with trees makes the best place to find squirrels and feed them. Section off an area specifically for them to feed. You can leave food in bird feeders, create a platform area or purchase feeders designed specifically for squirrels. You want to let them know that your yard is a safe place for them to forage, eat and even build their nests. Buy food such as peanuts, squirrel food blend or sunflower seeds for them to eat. You might not see them when you first start leaving food at the feeder, but they'll see you. If you feed them every day, they will become used to food being left for them by you. The more they see you leaving food at the feeder, the more they will associate you with good things and will become less frightened of your approach. Within no time, you should start seeing an abundance of squirrels at your feeder and in your yard. Don't be surprised if they show up at the back door, letting you know it's time for more supplies. Talk to the squirrels and make squirrel noises when you are by the feeder. You'll probably feel like an idiot and the squirrels won't have a clue what you're saying, but you'll become less threatening. Doing this while holding a peanut in your hand, makes you seem even more appealing. There's always at least one who will lose its fear and be curious about you. Notice which squirrels are brave and seem unafraid to get closer to you. This may take weeks and sometimes even months for the squirrel to build up courage. As long as you are non-threatening and patient, eventually the squirrel should be able to get within a few feet of you without scampering away. Having a peanut in your hand while this is happening, always helps encourage the squirrel to move closer. Stoop down and offer a peanut to the squirrel. Once again, this may take several days or weeks to get the squirrel to finally accept the nut from your hand. The main thing you want to enforce is you are not dangerous and the squirrel will get a nice treat if they allow themselves to get close to you. Their buddies will be watching the brave one and even a few of them might try to take the nut out of your hand eventually. Accepting the nut from hand, can now lead to more adventurous moves with the squirrel. You can start by simply sitting down and offering the peanut to the squirrel, but making them climb up on your lap to accept it. You can also put the nut on your shoulder and have them crawl up you arm to retrieve it.